Inflammatory arthritis typically starts in a patient’s smaller joints, but it can quickly spread to other parts of the body, such as the hips, shoulders, and knees. This can make common tasks—such as walking, lifting, or even sitting—difficult. Many times, the patient’s joints become hot and stiff, which can in turn lead to extreme fatigue, fevers, or weight loss. These problems can significantly change an individual’s ability to function and complete daily living activities. If you suffer from this type of arthritis either on its own or with any of these other conditions, then you may be unable to work and you may qualify for Social Security disability benefits. Inflammatory arthritis, or rheumatoid arthritis, may be a disability according to Social Security Administration (SSA) rules. However, in order be approved to receive Social Security disability for rheumatoid arthritis, certain criteria must be met. These criteria are described in Section 14.09 of the Listing of Impairments. Inflammatory arthritis in one of your leg joints, making it difficult to walk. Inflammatory arthritis in one or both of your arms, making it difficult to perform large or small tasks such as lifting, pushing, or pulling. Inflammatory arthritis that impacts at least two of your major organs, causing extreme fatigue, malaise, or other serious side effects. Inflammatory arthritis that is in your spine, making it difficult to move or causing serious disruption with at least two of your body’s systems. 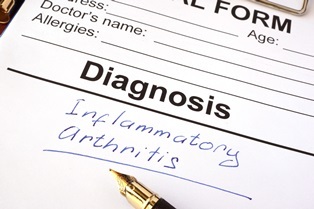 Inflammatory arthritis that flares up frequently and impairs your ability to interact socially with others, perform basic daily functions, or complete basic tasks. There must be at least two symptoms that limit your daily activities such as fever, fatigue, or malaise. If you do not meet the specifications described in Section 14.09, you may still qualify for Social Security disability benefits. You will need to prove that your condition will last for at least 12 months and that it keeps you from working any job. Your diagnosis. This includes any tests, such as imaging tests or blood tests, that were used to make an accurate diagnosis. Your treatment plan. All of the treatments that have been tried should be documented. Additionally, your compliance with doctors’ orders and treatments should be documented. The SSA expects that you will try all reasonably available treatments unless you have a good reason not to do so. A good reason could include a religious objection to the treatment, an allergy to the treatment, or if the side effects outweigh the benefits of the treatment. How your condition impacts your daily living activities. Arthritis impacts individual patients differently. It is important that the doctor note the limitations of your daily living activities and other consequences of your condition. With help from an attorney, you can demonstrate how your inflammatory arthritis impacts your daily activities and your ability to work. To learn more, download a FREE copy of our book, The 5 Most Frequently Asked Questions About Social Security Disability. You can also contact our office via this website at any time for help filing a Social Security disability case in Massachusetts, New Hampshire or Rhode Island. Severe Osteoarthritis Is Affecting My Ability to Work. Will I Qualify for Social Security Disability?